As we most know, the Original Air Jordan 9 (IX) was not worn by Michael Jordan, but the Air Jordan Original 9 (IX) Black / Red was a nice addition to ones collection. The Color scheme on the Air Jordan OG 9 (IX) is Black – Dark Charcoal – True Red. Over time, the Original Air Jordan 9 (IX) Black – Dark Charcoal – True Red tends to crack, and some pairs even contain flaws that are White blemishes. 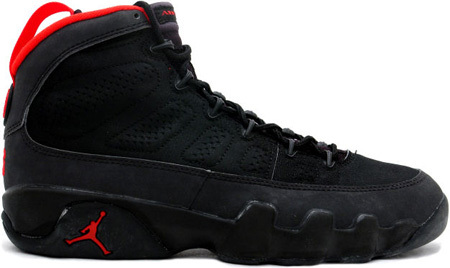 Retail for the OG Air Jordan 9 (IX) Black / Red was $125.